To be honest, this isn’t my first choice (Harry Potter) or even my second (Pokemon), nor is it even something I would choice at all. But it would be interesting, that’s for sure. I like zombies. My friends and I, back home, knew exactly what we would do in case of a zombie apocalypse. Ian would drive to my house in his pick-up truck, bringing various supplies including his machete. Michael would do the same, zipping down the less popular (and thus less travelled) back roads with his Louisville Slugger. We meet up, I get Ian’s machete in addition to my own, and he takes my hand axe. Michael and I hop in my car (2002 coupe Audi TT, outfitted for the track), and Ian takes the lead, blasting any zombies out of our way in his truck, again, down a pre-chosen route of back roads. We head north, picking up Ronnie on the way, who has taken advantage of the extra time and isolation (he lives in the middle of nowhere, relative to us) to pack more substantially. He has his 8 person tent, impressive first aid kit, and many other essentials all in three separate piles, ready for our backpacks, his own already packed. He too will have his bat ready and will be on the roof, looking for our approach and acting as lookout as Ian, Michael and I pack and go over our mental checklists, insuring nothing is forgotten. Michael now joins Ian in the truck and Ronnie and I follow in the TT as our little caravan makes its way north, a list of survival stores as our targets. Depending on what our radios tell us, we make our next move. If the situation seems to be under control (or as under control as a zombie apocalypse can be), or appears to have an end in the very near future, we hole up at the first store on our list that hasn’t been looted and is zombie free. If things appear grim, we gather as many supplies (guns, ammo, outdoor living supplies) as we can, we head north, and we don’t stop. Think we’ve put too much time and thought into this? We probably have. The odds of a zombie apocalypse are astronomical. And we don’t anticipate one. It’s just fun. That’s why I’m choosing the world of Left 4 Dead. If there’s going to be a zombie apocalypse, we better pray for slow zombies. Smart zombies? Fast ones? No thank you. And again, I wouldn’t willingly walk into a world where I’m almost certainly going to be torn limb from limb and devoured, where nearly everyone I ever knew is dead, but it’s interesting to me. And if the zombies do come? I’ll be ready. I like zombies too. 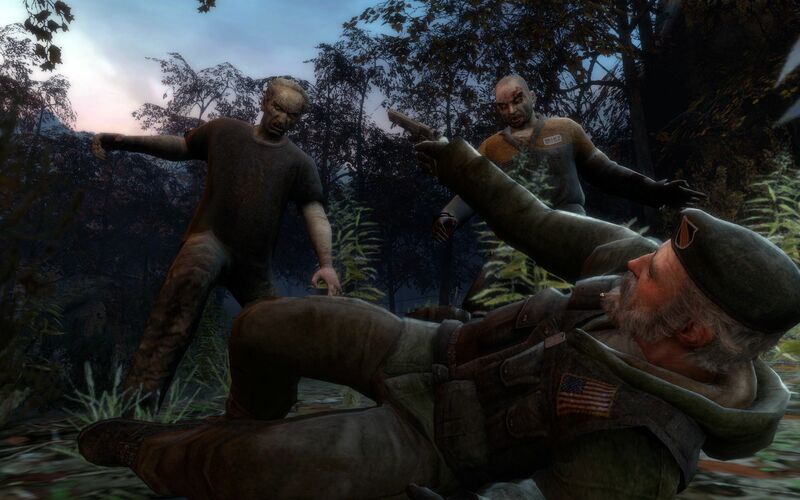 Have you played l4d2? Especially the new map with the old team and the new? I’ve played it a bit, but I don’t own it and I haven’t played that map. I’ll have to try it out though! Previous Previous post: Spartan 004, report for duty.